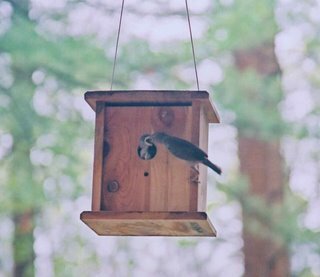 This bird house hangs right outside my kitchen window. I have been watching these birds from the building of their nest to the birth of the babies. The baby birds are getting big, and the mother feeds them all day long. I don't know what kind of birds they are, even though I tried to look it up. Yesterday, I set my camera up on the tripod inside and spent about 3 hours taking photos of these feedings. After 5 rolls of film, I did get some photos that I really like, and I'd like to share them with you. A really cool sequence of shots. Very nice series of photos. The muted background works really well. It shows the trees, but doesn't distract from the bird house or the birds. The first one in the post is my favorite, especially when viewed full size. I've had so much fun watching these little birdies every day. I hope I get to see them fly away for the first time. I'm still researching, but I also think it's some sort of wren. Seeing them this close is so fascinating that I've been keeping vigil over these little birds daily. I'm not getting much of anything else done, though. Oh, well. Tom, your're right. 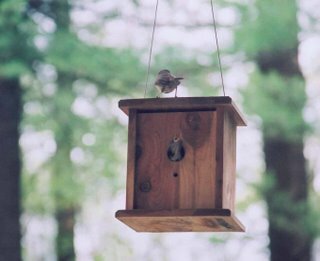 I found the bird in my "Birds of Massachusetts" book, and it is a house wren. 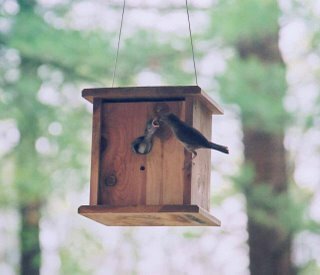 The mother and father feed the birds for 12-15 days. I'm not sure how long I've been watching, maybe about half that time. I'm going away on the 15th and hope they fly away before that. Yesterday, the mother and father showed up with food at the same time, and the mother pecked the father away so she could feed them first. It was interesting to see. I guess we know who the boss is in that family! But these are absolutely lovely shots, you've captured them perfectly. Well done! Thanks, Nancy. I appreciate your comments. Try again for that bird house.